How to Develop WordPress for SOCIETA? WordPress offers a convenient interface for developing and managing websites. It is a great solution for building effective websites dealing with complex data that need frequent up gradation. With a skilled use of WordPress one can add a great look and feel to personal websites, news sites, sites involving product catalogues, e-commerce websites and much more. A wonderful instance of effective WordPress development is the website WebGuru has crafted for SOCIETA’, a company based in Turkey, Istanbul. It deals in women’s apparels and accessories created by top designers. 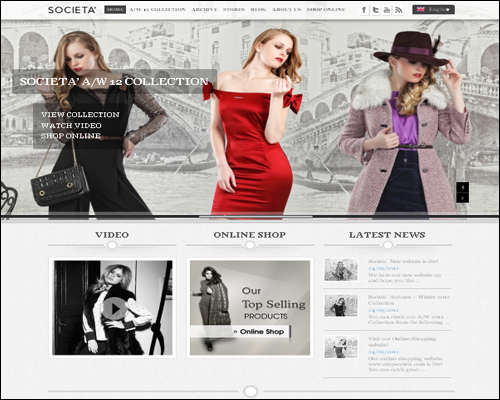 SOCIETA’s major purpose of creating this website is to have a strong online presence highlighting the company’s strong brand image and the wide range of collections. WebGuru has created an attractive and highly interactive website which is extremely easy to manage from the backend administrator panel.